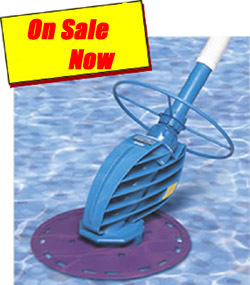 CLEANS FLAT BOTTOM OR DISHED OUT POOLS UP TO 72" DEEP! This powerful cleaner features the same technology as its in-ground cousin, the Baracuda® G3™. With only one moving part, it will thoroughly clean your above-ground pool of debris, twigs, leaves, and even pebbles. Since there is only one moving part, there is less maintenance on Ranger™ than other cleaners. The patented "Easy Access System" lets you remove the "flapper valve", service it yourself, and replace it right at your home. You can install the unit in minutes without any tools or special fittings. Since it runs off of your pool's pump and filter, Ranger™ cleans automatically anytime that your pump is operating. Unlike other cleaners, Ranger™ cleans quietly without the annoying hammering noise that other cleaners make. The unit comes complete and ready to attach to your skimmer with 36-feet of hose. Backed by a One-Year Warranty. *Note: The MFG Warranty on this unit is only Valid in the United States. All Sales outside of the USA will Void the Warranty.